A couple of high school sweethearts living in their hometown of Batavia, Illinois, Andy Kenney and Ariane Scholl are the brains and heart behind their hand-poured candle brand. They built a small business on the values of wanting their products to be sourced from the USA and made by hand. Since the beginning, all of Andy and Ariane's candles have been hand-poured in their home, each with a little of their own personality. Between the two of them, a wide variety of work gets done after their busy nine-to-five jobs. Andy, who works as a graphic designer, is in charge of the visual aesthetic and packaging for their brand. Ariane is the true visionary and wickedly talented chandler behind all their candles. She also reads way more books. 3.5" H x 3" dia. Trim wick to a quarter inch before lighting. Never leave a burning candle unattended. Keep candle free of any foreign materials including matches and wick trimmings. Only burn the candle on a level, fire resistant surface. Do not burn the candle for more than 4 hours at a time. I will be purchasing more of these candles to give as gifts. It adds such a cozy atmosphere to our home. The candle label was so cute and ideal for Christmas with its reference to the famous Christmas poem. I bought 2 for gifts. The glass container is extra sturdy, with thick glass. The little drawstring bag was a terrific touch for gift-giving. So in terms of appearance and presentation this candle is perfect for male or female recipients. I, personally, was disappointed in the scent which was almost non-existent. A great berry or cinnamon or tree scent with a big, long throw would have made me much happier. I highly recommend this candle if you need something that looks good and is clever. If you care about scent I would pass. I found the smell not very pleasant. Also, it was supposed to crackle like a fire when it burned. It was very faint. Best candle I have ever had! I love the smell of this one. I don't like smelly candles. This one is the best I have ever had. I need more! Love, Love, Love. . . Hearth and Hammer is terrific. Their literary candles are the best. This is by far my favorite. The new wick works wonderfully so the whole candle is consumed. You definitely get your money's worth, and the scent is heavenly. I have given several as gifts, but mostly keep them for myself! I love Hearth and Hammer candles. I always have one in my home and have given them as gifts multiple times. 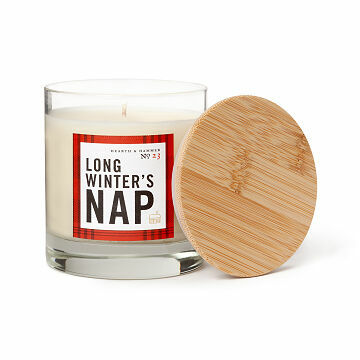 Long Winters Nap smells divine.